Takes guesswork out of designing for color blindness. Is there a better alternative to Color Oracle? Is Color Oracle really the best app in Author Tools category? Will Color Oracle work good on macOS 10.13.4? 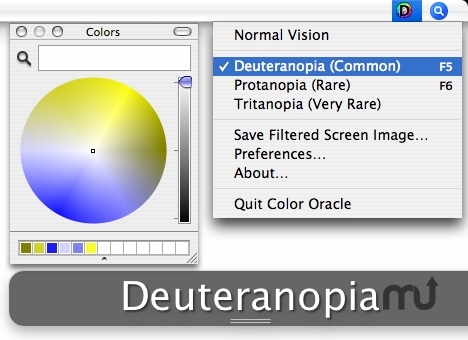 Color Oracle takes the guesswork out of designing for color blindness by showing you in real time what people with common color vision deficiencies will see. Color Oracle applies a full screen color filter to art you are designing - independently of the software that you are using. Seeing is believing! Instantaneously identify and correct problem colors in your art using Color Oracle's system-wide menu and keyboard shortcuts accessible in any program.